Japan. At midnight on 20 February 2012, the Takahama-3 reactor in Fukui Prefecture was shut down for regular inspection and refueling. 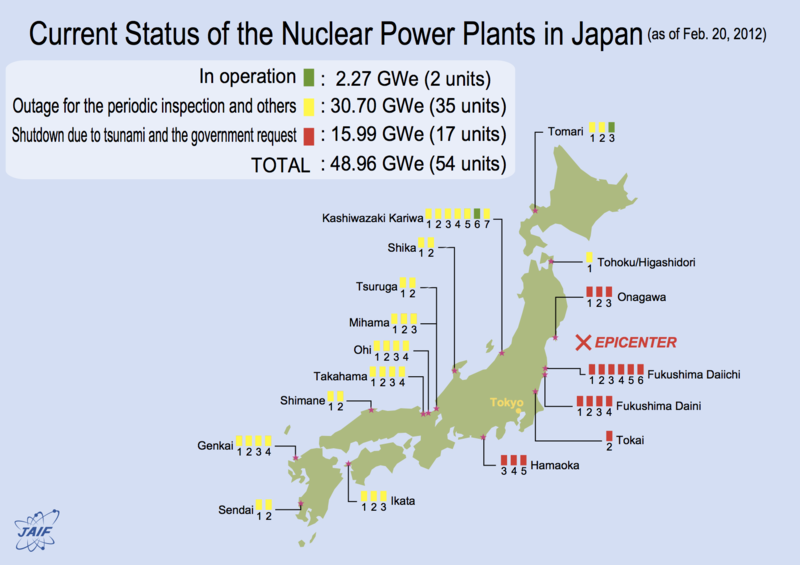 That leaves Japan with only 2 of its 54 commercial reactors operating. The Kashiwasaki-6 reactor in Niigata prefecture is scheduled to be taken off the grid on 26 March and the Tomari-3 unit in Hokkaido is expected to shut down by late April 2012. Restart of any of the idled reactors has so far been prevented by local authorities and an increasingly vocal citizen movement. On 8 February 2012 a coalition of NGOs supported by Litterature Nobel Kenzaburo Oe announced that they had colleced 5 million signatures on a petition asking for the immediate end of the nuclear program in Japan.